This information can help you keep your floors looking their best, longer. • Use a lightly dampened cloth to clean up spills and spots as soon as they happen. For tough spots, such as oil, paint, markers, lipstick, ink, tar, or cigarette marks, use mineral spirits on a clean white cloth, then wipe with a new clean lightly dampened cloth. Always avoid allowing liquids to stand on your floor. • Sweep, dust, or vacuum the floor regularly with a soft bristle brush or felt brush to prevent accumulation of dirt and small grit that can scratch or dull the floor finish. • Occasionally wipe the floor with a lightly dampened mop or cloth. • Periodically clean the floor with a good quality floor cleaner. Spray and dry mop. • Don't use any wax, oil soaps, polish, vinegar, oil-based or ammonia-based cleaners. • Don't use steel wool or abrasive cleaners. • Do not wet-mop. This could cause swelling, warping, delaminating, and joint-line separation, and will void the warranty. • For spots such as candle wax or chewing gum, harden the spot with ice and then gently scrape with a plastic scraper, such as a credit card. Be careful not to scratch the flooring surface. Wipe clean with a lightly dampened cloth. • Good quality entry and exit mats will help collect the dirt, sand, grit, and other substances that can be tracked onto your flooring. To prevent slippage, use an approved no-slip rug underlayment. • Avoid excessive exposure to water during periods of rainy or snowy weather. • Never try to slide heavy objects across the floor. 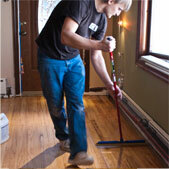 We recommend that you take maximum precautions to keep your new floors looking their best. Don't walk on your flooring with stiletto-style heels, spiked golf shoes, or cleats. They will cause small indentations in your flooring. Use floor protectors such as felt pads or round floor coasters on all furniture, tables, chairs, etc… to prevent denting and scratching. Keep your pet's nails trimmed to keep them from scratching your flooring surface. Maintain a normal indoor relative humidity level between 35% and 55% year round to minimize the natural expansion and contraction of wood. A humidifier is recommended to prevent excess shrinkage due to low humidity levels during dry winter months. Wood stove and electric heat tend to create very dry conditions. A dehumidifier or periodically turning on your heating system can maintain proper humidity during the summer months. Did you know wheels aren't always OK on Hardwood?